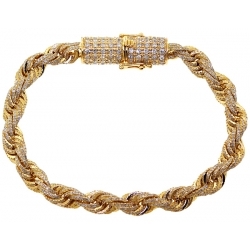 Men's wrist bracelets are no question, the most popular and commonly worn accessories. Some guys prefer classic and simply handsome designs like mariner, figaro and rope, others go with heavy and completely iced out franco and miami cuban link designs. Usually, it is a matter of your taste, build and budget! At 24diamonds.com we are proud to offer various styles of bracelets for men, so everyone will be able the right piece to wear for a lifetime! All jewelry is professionally handmade by very experienced jewelers in order to deliver the highest quality possible and make every customer completely satisfied with the product purchased. Our collection features absolutely unique pieces like mens diamond id bangles, stunning skulls and other fancy link designs. 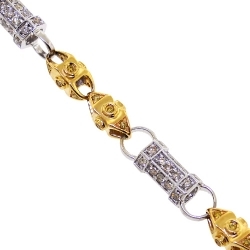 If you are too conservative for a bling, there are hundreds of plain 10, 14 and 18k gold and 925 sterling silver bracelets of different styles like miami cuban, bead, box, byzantine and much more! With our huge online selection with different sizes, colors and prices you will find the right piece for you! With over five hundred women's wrist bracelets available at our store, you can definitely find the right piece for yourself! Featuring the most popular styles of bracelet for women such as bangle, bead, byzantine, charm, ankle, evil eye, cuban, herringbone, id, mariner, rope tennis and other! These wrist bracelet designs are available in plain 10k, 14k, 18k gold, 925 sterling silver and stainless steel of white, yellow, rose, two and three tone colors. If you like more upscale stuff, we are proud to offer one of a kind pieces with natural diamonds and gemstones... from blue sapphires, green emeralds, red rubies, pink tourmalines, black onyx, purple amethyst, pink quartz to white, fancy yellow, brown and black diamonds, it is only a matter of your taste and mood which bracelet to pick. All the jewels are professionally handmade by experienced jewelers and each piece is passing the highest quality standards before shipping to a customer. Make your choice today and start wearing one of the beauties below as soon as possible! Baby or kids bracelets are getting more and more popular these days! Parents always want their kids look best anytime and anywhere, that's why are happy to offer our special selection of baby bracelets. This is absolutely eco-friendly and non-allergic jewelry that would make your son or daughter feel special and excited. 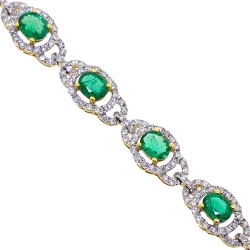 Here at 24diamonds.com we have various designs of these bracelets: from gemstone beaded to figaro, mariner and curb a special id plate that can be engraved with baby's name or other birth related information. All featured items are handmade by professional jewelers to achieve the high quality possible and to make sure each piece is durable enough to be worn by children. Our bracelets are available in 925 sterling silver, 10 or 14k gold of different colors: white, yellow and rose. Whatever you are looking for a plan, diamond cut or accented with various patterns bracelet for your kid, you will find the favorite one here! 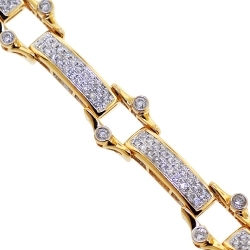 Shop online for men's diamond bracelets with absolute confidence and peace of mind! With our trusted experience, large inventory of women's diamond bracelets and professional customer support, you can make the purchase without any doubts. One of the most popular jewelry accessories today, the bracelets express style, taste and class of their owners. 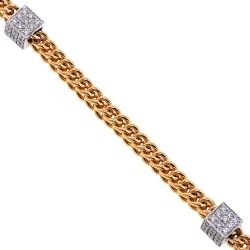 At 24diamonds.com we offer mostly all existing designs of diamond bracelets for men like beaded, franco, miami cuban, rope, id and other types available in 10k, 14k and 18k gold in various colors like white, yellow, rose, two and three tone. 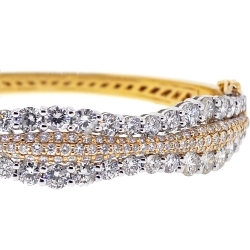 Talking about diamond bracelets for women, we have such popular and timeless styles as bangle, cuff, tennis and more. Accented with natural gemstones like amethyst, topaz, citrine, emerald, sapphire and ruby, these jewels are expertly handmade to catch everyone's attention at first sight! Wide mesh, art-deco inspired, oversized cuffs, animal theme and other styles and designs are presented here in order for you to find the perfect one! Gorgeous gemstone bracelets for men and women are adding more bright colors and inspiration in our daily life! All featured women's gemstone bracelets are handmade by highly skilled jewelers with top quality natural diamonds and gemstones. Alluring shine of blue sapphire, green emerald, red ruby, garnet, white quartz, blue lapis lazuli, tanzanite, purple amethyst, black onyx and other stunning stones mixed with sparkling white diamonds makes these pieces of jewelry a true objects of art! Beaded, bangle, cuff, evil eye and tennis bracelets are available in 10, 14, 18k gold, platinum, 925 sterling silver and steel of different colors: white, yellow, rose, two and three tone. 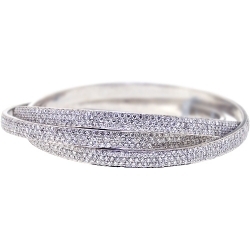 For those who is looking for one of a kind bracelets, we have oversized gemstone bangles fully encrusted with icy white round cut diamonds; if you are looking for a timeless and classic design we recommend to go with a beaded style. Make your own choice that would match your taste, wardrobe or budget and start enjoying one of our beautiful jewels as soon as possible! Always shinning men's gold bracelets do not loose their value or go out of fashion! These gold bracelets for women are timeless accessories being worn for many centuries: from ancient Egypt to our days, and no doubt, designs of the bracelets has changed dramatically. From delicate vintage filigree patterns to masculine miami cuban, franco, mariner, rope, box links and much more you can find at our online store! We also have a large selection of feminine ankle, bangle, bead ball, byzantine, charm, evil eye and herringbone bracelets at very competitive prices! There are a lot of variations to choose from: 10, 14 or 18k gold grade, hollow, semi-hollow or solid, single color of gold or two, three tone, encrusted with diamonds and gemstones, made with a diamond cut effect or completely plain. With over three hundred items of different make and price point you are able to find your favorite piece and purchase it with a peace of mind, - all our bracelets are handcrafted by very experienced professionals and the highest quality guaranteed! Handmade sterling silver bracelet for men and women is a good alternative if you are looking for a high quality, gold or platinum looking bracelet, but have a limited budget. All our silver jewelry is professionally handcrafted by highly skilled jewelers and feature top quality work with a nice smooth finish and state of art craftsmanship. From mens miami cuban, franco, byzantine to ladies bangle, ankle, charm, evil eye and tennis links to unisex beaded bracelets with natural gemstones like purple amethyst, red carnelian, garnet, green emerald, jade, onyx, blue lapis lazuli, pink, white quartz, ivory riverstone, brown tiger eye and more! We have these designs available with different length, width, shape and closure type. All silver bracelets are great to wear on a daily basis, mostly with any informal outfit and other matching silver jewelry. Some fashionistas love to match their bracelets with watches or wear a few pieces together and enjoy the gleaming look of sterling silver. Stainless steel bracelets are widely popular and worn now because of good quality and the most important, affordability. Most classic designs look like a real silver, gold and even platinum, but cost hundred times cheaper! Yes, it is not a precious metal, but if the look is the most important for you, why not?! Solid stainless steel is a good material that can last forever; today's plating technologies making the steel jewelry plated black pvd, white, yellow and rose gold keep its color for many ages as well without loosing the chic and luster. If you are looking to buy a bracelet and have a very limited budget, the steel bracelet would be a good choice! Here at 24diamonds.com we carry high quality franco, rope, snake, beaded, charm, bicycle links in white, yellow, rose and black colors, from really elegant, lightweight to massive, oversized designs; the majority of them are plain metal, but some are mixed with ceramics and other metals to add some sophisticated touch! 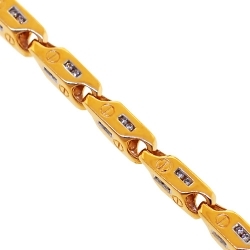 Miami cuban link bracelets for men are still number one seller across America. Highly popular among hip hop stars, football and basketball players, these bracelets are catching everyone's attention right away! From fashion magazine covers to music videos, you definitely noticed these oversized masculine designs! The cuban links are thicker than the average variety of other designs; with a unique interlocking pattern that makes even the thinner links look more substantial when they are connected together to form a bracelet. Like other types of mens gold bracelets, miami cuban links come in different types of gold, both 10K and 14K yellow, white, pink or rose gold. With a smooth perfectly polished finish, various sizes available, the bracelet would be a great fit for any wrist size. 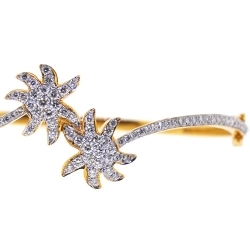 At 24diamonds.com we have a huge selection of miami cuban bracelets: plain gold, sterling silver and completely encrusted with top quality diamonds, so you find your favorite one and start wearing it as soon as possible! Another popular type of mens bracelets is franco. This style is famous worldwide among hip hop singers, athletes and other jewelry fans. 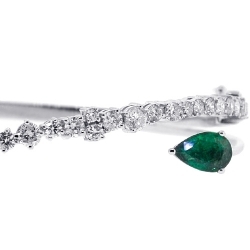 Handcrafted in Italy by professional jewelers, the production of these items requires a complicated manufacturing process with particular special skills and perfectionism of the highest level. Franco bracelets are designed with special V shaped links that makes a little difference in comparison with other bracelets. 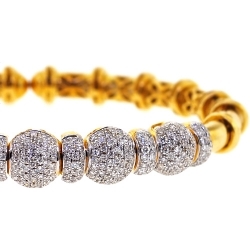 24diamonds.com offers a large selection of these bracelets available in 10 and 14k gold in yellow, rose or white colors, plain, diamond cut and completely encrusted with high quality diamonds. If you are looking for the unique statement piece, you cannot find anything better as our iced out 43.11 carat diamond Franco in 10k yellow gold. For more affordable bracelets, please check our selection of 925 sterling silver and steel items: classic or covered with black pvd. Make your choice now and start wearing one of them as soon as possible! 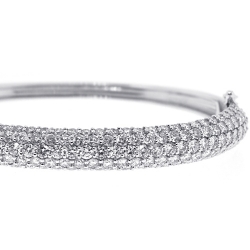 Our graceful womens bangle bracelets are available in plain 18, 14 and 10k gold, platinum and sterling silver as well as fully encrusted with gemstones and diamonds to get the most impressive, one of a kind look! Glittering with white, black, brown, fancy yellow diamonds, blue sapphires, red rubies and green emeralds, these jewels are truly a state of art pieces! Professionally handmade by highly skilled masters, the featured bracelets are crafted to last and be enjoyed forever! From absolutely fabulous and unique designs like pyramids, spikes, evil eyes, filigrees, flowers, snakes to classic forms and shapes... available in six to ten inches in length as well as adjustable variations. We also carry some fancy masculine designs for men: large oversized military and id bracelets fully iced out with round and princess cut invisible set diamonds. If you are looking for a new piece of jewelry, we are here to help and assist you with more affordable or one of a kind statement pieces at very competitive prices! Twisted mens and womens rope bracelets are classics and got their roots from the early 20th century. The design of ropes has not changed much since then, just became more fancier with diamonds that could be encrusted all over the bracelet. Featured at 24diamonds.com designs are professionally handmade with two and more thick strands woven together making a stylish rope. Some people prefer to wear a few bracelets on same hand at the same time, because of their flexibility it is a great way to experiment, especially with different colors. 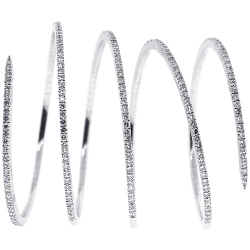 Our bracelets are made of 10k yellow and white gold, have a smooth polished finish and secure closures. Widely worn by both men and women, this style is available from thin and elegant versions for women to oversized and heavy for mens to be worn daily with almost anything formal or informal. The items are available for almost any wrist size and budget. If you are so in love with the ropes, please check our section of rope chains to become the perfect pair! Bead ball bracelets for men and women are coming from the Buddhist culture and have been a Tibetan monks talisman by many centuries. They believe that each bead of the bracelet gives you strength, joy, balance and wisdom. For the past twenty years these ball bracelets became to popular so you can see them all over the place: from tv, magazines, newspapers to the wrists of different celebrities! Flexible and fancy-looking, these accessories could be perfectly worn with all outfit, from formal to informal, and will any other jewelry. There is a trend now where people wear two and more bead bracelets at the same time along with the wristwatch. Here at 24diamonds.com we are proud to offer you a special selection of luxurious bead ball bracelets in 10k, 14k, 18k gold, 925 sterling silver and stainless steel steel. Most of them are designed with the natural gemstones like amethyst, carnelian, jade, lapis lazuli, malachite, onyx, riverstone, tiger eye and of course, diamonds. Great collection for any taste and budget! Womens anklet is summer must-have and it does not matter if you live near the sea or ocean, you do not have to go to the beach to wear them! Ankle bracelets are one of the most traditional jewelry types coming from the ancient times. 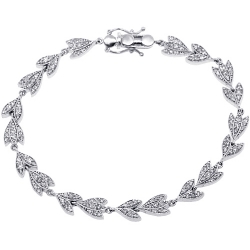 It does not matter which ankle it is on, the bracelet would compliment and add some extra chic to you look. You can even mix them for the best effect! With our selection of anklets handmade of 925 sterling silver and 10k gold you will find your favorite treasure! Available in major styles like herringbone style, with charms, rope, byzantine, mariner, box, cuban, singapore link, figaro, hollow, semi-hollow, solid, thin, oversized, light, heavy and other, also different colors as white, yellow, rose, two and three tone, sizes from eight to eleven inches long; all these makes it simple to match the desired piece with your style and outfit and be ready for the warm season, or if you are lucky to live in the tropics to wear it everyday for years! Our custom made gold id bracelets for kids and men are polished to the perfection and professionally handmade of 10, 14 and 18k gold! A special engraving plate on each bracelet makes it really unique and special... it could be a name of your kid, husband or a loved partner as well as other birth related information. You do not need to bring the item to a local jewelry store, because at 24diamonds.com we are always glad to assist you with the top notch engraving services. These jewels are great as anniversary, birthday, wedding, graduation and other special occasion gifts. 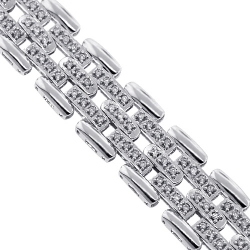 With our large selection with id jewelry you can find the right piece to purchase: from classic figaro, mariner, cuban links for children to fully iced out with round and square princess cut diamonds mens bracelets of various link designs... from very affordable to exclusive, but discounted luxury bracelets. Make your own one of a kind statement with one of the featured designs below! Beautiful evil eye bracelet is the most common talisman that is always with you, worn on the wrist! The main purpose of these women's diamond bracelets, except the stylistic, is to protect the wearer from the envious eyes around. This belief has been in existence for centuries and still staying strong in the Middle East, Africa, South and Central Asia, and parts of Europe like Greece and other places. Even today people love to wear these protective diamond bracelets, especially the ones offered here, with the highest quality craftsmanship and the best available on the Earth materials used: from top quality sparkling diamonds, natural gemstones and multicolored enamel mixed with each other as as the result, - getting one of a kind luxurious pieces that are always protecting you all day and night. Our company offers a gorgeous online selection of evil eye bracelets in 14 & 18k white, yellow and rose gold, perfectly finished and ready to wear. If cannot afford those stunning pieces, please check our affordable plain gold and sterling silver designs. Handsome figaro link bracelets for men and women are one of the popular designs in the United States and regarded as the classic type. 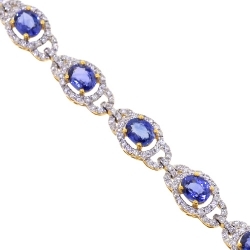 If you are too conservative for other bracelets, this one should be a perfect match! 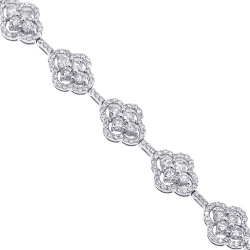 Professionally handmade of multi-sized links that makes the final look unique and very special. 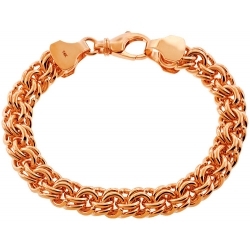 A regular figaro link bracelet has a pattern of three smaller links with one larger link and this repeats across the entire piece and makes the design idea complete. 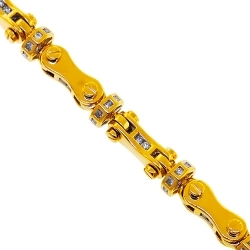 Some bracelets are handcrafted entirely of one metal, for example 14K yellow gold, while others are two and three tone. 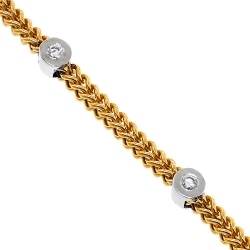 At 24diamonds.com we have a stock of mens and womens figaro links available in 10 and 14k gold and 925 sterling silver. We also carry the bracelets with a fancy diamond cut effect which makes the piece sparkle a lot and look like it is made with real diamonds. From massive sizes to elegant pieces with different prices in order for you to choose accordingly! These bracelets are perfect for the regular wear. 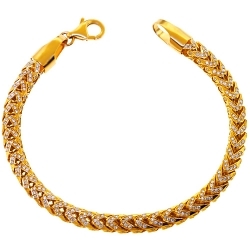 Stylish flat miami cuban link bracelet for men is a variation of the regular cuban link, but made without its normal thicknesses. Like all other mens bracelets, the flat cubans come in different grades of gold like 10, 14k yellow, white, pink, rose, two and three tone. Most of these designs are accented with a special diamond cut effect to add an extra sophistication and chic look. Such a detail makes each bracelet sparkling in its own unique way! Once you see this particular pattern, you will be able to recognize it later right away. All the items are manufactured by highly professional jewelers and each piece features a smooth perfectly polished finish for a nice touch and feel! We offer various price ranges and sizes available to make the bracelets fit almost any wrist. The items vary from three to eleven mm width and from seven to nine inches long. 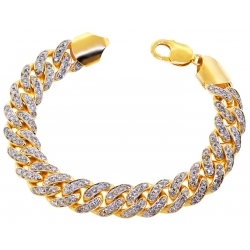 Please check our collection of flat miami cuban link bracelets and you will find the most desirable piece! Presenting one of the most demanding accessories today - mariner bracelets. Getting their roots from the jewelry custom made specially for seaman as a symbol of brotherhood and belonging to the sea, the bracelets became widely popular by all others. The designs feature circular links with a bar through the center, reminding an anchor chain design. Mariners have a wide range of variations available: from elegant narrow and flat links to puffed and massive masculine styles. We offer this jewelry made of Italian 925 sterling silver, solid gold of 10k and 14k available in white, yellow and rose colors. Handcrafted by highly skilled jewelers with over 20 years experience, the jewels have a smooth and highly polished finish and sleek appearance to make the everyday wear really enjoyable, any of these mariners is a stunning choice for a person who wants brighten up the wardrobe! You may also find ideally matching mariner necklace and start showing off with them together and make a stunning impression! $9,436.00 CUSTOM ORDER. SHIPS WITHIN 2 WEEKS. $3,975.00 CUSTOM ORDER. SHIPS WITHIN 2 WEEKS. $7,986.00 CUSTOM ORDER. SHIPS WITHIN 2 WEEKS. $3,692.00 CUSTOM ORDER. SHIPS WITHIN 2 WEEKS. $5,512.00 CUSTOM ORDER. SHIPS WITHIN 2 WEEKS. $9,343.00 CUSTOM ORDER. SHIPS WITHIN 2 WEEKS. $22,064.00 CUSTOM ORDER. SHIPS WITHIN 2 WEEKS. $7,128.00 CUSTOM ORDER. SHIPS WITHIN 2 WEEKS. $11,880.00 CUSTOM ORDER. SHIPS WITHIN 2 WEEKS. $5,729.00 CUSTOM ORDER. SHIPS WITHIN 2 WEEKS. $36,136.00 CUSTOM ORDER. SHIPS WITHIN 2 WEEKS. $21,575.00 CUSTOM ORDER. SHIPS WITHIN 2 WEEKS. $9,975.00 CUSTOM ORDER. SHIPS WITHIN 2 WEEKS. $8,918.00 CUSTOM ORDER. SHIPS WITHIN 2 WEEKS. $12,291.00 CUSTOM ORDER. SHIPS WITHIN 2 WEEKS. $3,718.00 CUSTOM ORDER. SHIPS WITHIN 2 WEEKS. $4,442.00 CUSTOM ORDER. SHIPS WITHIN 2 WEEKS.